Tatarstan, Naberezhnye Chelny, Avtozavodsky prospect, 25/05. The organ hall. 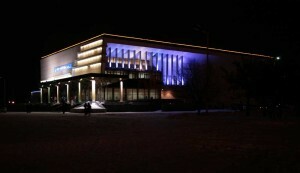 Inauguration of Naberezhnye Chelny body of took place on 1 March 2005. At the opening of the Organ hall, there were such famous musicians as pianist Nikolai Petrov, organist Rubin Abdullin, singer Irina Arkhipova, and led a concert of Svyatoslav Belza. Congratulated the citizens of Naberezhnye Chelny RT President Mintimer Shaimiev. Tatarstan, Naberezhnye Chelny, Avtozavodsky prospect, 25/05 on the map. The organ. The organ hall. Organist David Tim.Building under construction savings Bank in Naberezhnye Chelny.